Today was pretty uneventful, despite some things not going according to plan. We woke up at around 8:00 to pack our stuff and eat a slow breakfast before getting picked up by Wayne (from Alps2Ocean) at 9:00 AM. 9:00 rolled around and no one showed up. By 10:30 we were talking to the older German couple who was also waiting for the ride. Using the wifi at the campground they managed to reach Wayne who explained that someone had come for us but saw no one and left. Turns out he went to the other lake to look for us not knowing about the campsite by Lake Clearwater. We reached Wayne by using the free phone by the road. He didn’t have anyone available to pick us up until around 5:00 today. Eventually we decided that 5:00 today would be a good idea if we could pass through Geraldine to grab another day of food from the Fresh Choice. Bruce and Anna, two campers by the lake, let us into the hall building so we could sit on the couches out of the wind and rain. After we helped Bruce move their gear into the hall in preparation for their heading home for the summer, we passed the time by watching Annie Hall on Sam’s iPad. At 5:00 we headed to the main road where Wayne was set to pick us up. He rolled up at around 5:15 and we began the drive around the Rangitata River. We stopped first in Geraldine to pick up an extra day of food to compensate for the day lost. The ride from Geraldine to the trailhead was gorgeous. Huge snowy mountaintops got the 6 of us extremely excited for the Two Thumb Range. At around 8:00 we made it to Mesopotamia Station, one kilometer south of the Bush Stream trailhead, where we said thank you and goodbye to Wayne. For $15 pp the Shearer’s quarters at Mesopotamia station is incredible. 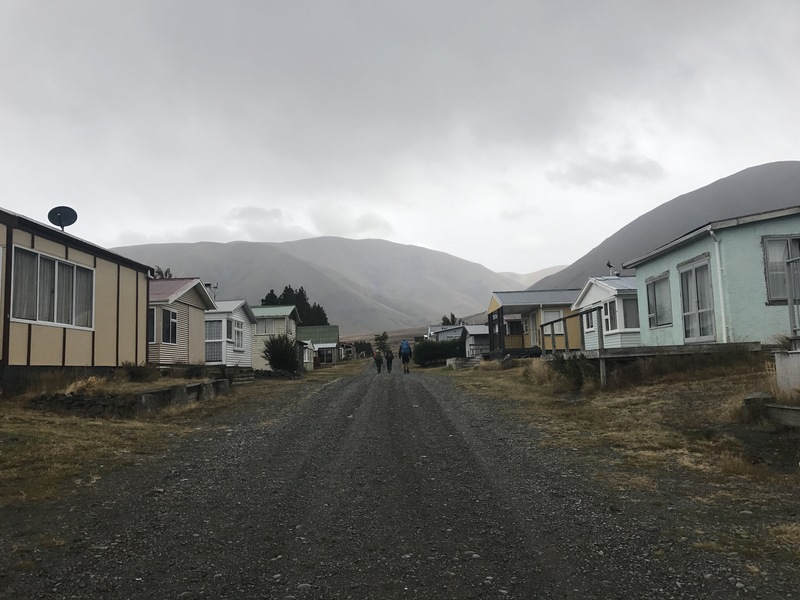 With a fireplace living room, full kitchen, bathtub, and plenty of comfortable bedrooms, it was exactly the right place to celebrate getting around the Rangitata, thus ending the most logistically tricky section of the trail. Sam and I made a huge dinner of curry with tons of veggies and tuna plus a salad appetizer. The whole time we were cooking all of us listened to the Mark Knopfler CD from the boombox over and over, the songs getting us amped for the days to come. Dessert was a boysenberry crumble cake. Awesome. We finished the day with a few rounds of hearts around the fireplace. Excited to get moving into the mountains tomorrow.